Welcome Hexie Queen Hoppers:) I am very excited to be part of this super fun hop:):) Thanks to Debby for hosting it....Her blog can be found HERE. I will have today's list of players at the bottom of this post:):) So, Hexagons...what can I say about Hexagons? I LOVE them...Have always been fasinated by them:):) Above...was a quilt given to me by a friend...She found it at a gargae sale. It is all hand done!!!! and king sized!!! Next I will show you my attempts over the years at making Hexies quilts. On a smaller scale...I decided once...to try my own hand at hexies....1/2 inch...yikes...what was I thinking?.....well, I must confess...I have started many Hexie quilts over the years and have never finished them...am I the only one??? I got this very cool die cutter at Hobby Lobby in two sizes....I could punch these out all day...LOL!!!! But, with my love of all things Hexies...I decided to try one more time...So, I have been making these in front of the TV ...for a while now....But, I have not sewn them together...cause...well, Its hard...so they sat again.....Then I signed up for the Hexie Queen hop...hoping to find inspiration once again:):).... and just went searching for something that would really ring my bell...and I found it...I saw someone on Pinterest sewing Hexies together by machine.....MACHINE??? Yes!!! I was totally in!!!! ...and now I may get a scrappy Hexie quilt done for the first time in my life!!!!! Yeah!!!!! Sew them in long rows ...then sew the rows together....Easy Peasy!!!!! I knew you would do something fabulous ! And you did ! 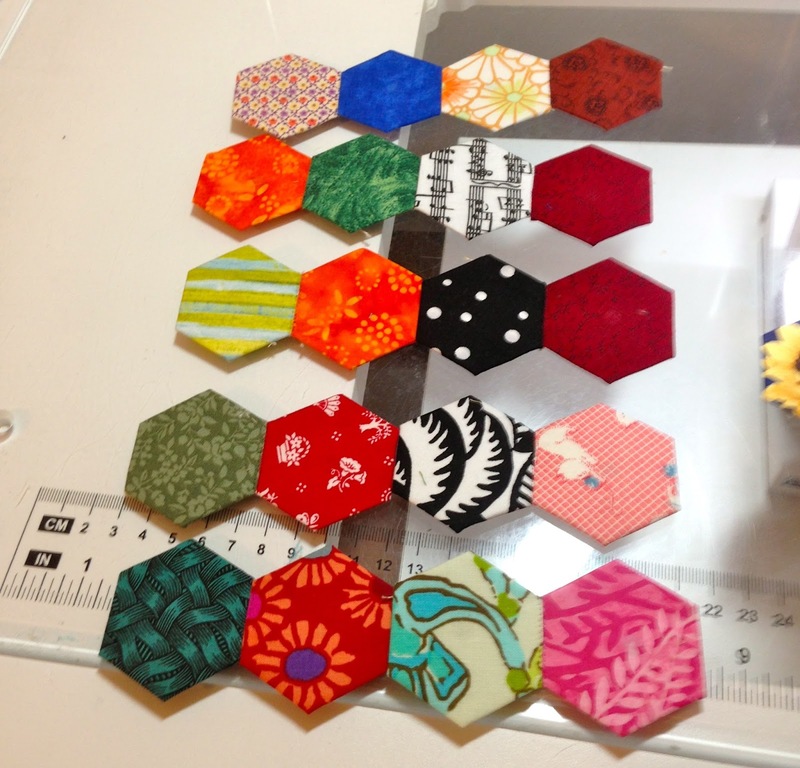 I love the idea of sewing the darn hexies together with mono-filament Great idea ! Thanks. But I still don't like hexies. Those first hexies are very, very small! I am amazed you could fiddle them in such a perfect shape! The fun is in the journey, not always the destination. Besides, finish this one....and you'll only have to start another one! I must admit, I am looking forward to seeing it finished...... Well done you! So many fun ideas! Thank you! And you're not the only one to always start new hexie project, I can tell you. I have two finished quilts, and a lot in work. I love the process. What a great idea - not one I've seen before! I love the paper hexies too! I love your trial to sew the hexies together by machine. Thanks for sharing all your unfinished hexies. Hi Sandra, I love your hexies and I'm hooked too as they can use up so many scraps. But I am confused. Did you use the punch from Hobby Lobby to cut the fabric or the paper? Anything is helpful to speed up the process. Thanks for sharing. It is beautiful so far. I can't wait to see what it becomes. Nice job. Wow! I am impressed with your tiny hexies. I love the paper hexies and would love to see how you use them on cards--very pretty. Modern quilting certainly helps us speed up today's sewing of old patterns. Beautiful work so far on that new quilt! Thanks for sharing your pretty hexies. And thanks for the pics on how to sew them together. Gee... those first attempts aren't failures.... they are great! Tiny little 1/4".... Yikes! Good luck with the quilt... it's going to be lovely! Great technique for making and sewing the hexis...thanks for that! Your project is beautiful! So glad you showed all of this..makes it much faster. I love this. You made it very special. I love the idea of machine sewing the hexies together. Will be trying that myself. Paper hexies for cards is a neat idea! Your quilt is going to be lovely. Thanks for sharing. I'm not a fan of hexies, but I like the method you showed...maybe I'll give that a try someday. Or maybe not! LOL Love those teenie tiny hexies...wow! Oh WOW!! 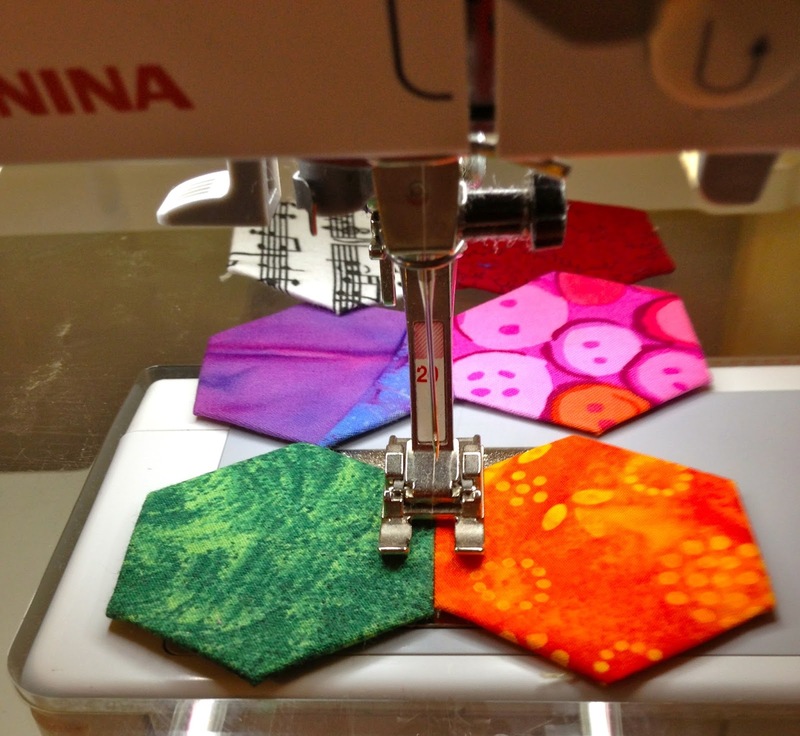 Thanks for sharing how you sewed your Hexie's together using a sewing machine. I was given to large baggies of Hexie's (found at Goodwill) and have been wanting to sew them together but have not wanted to attempt the hand stitching. Love the Grandmother's flower quilt also. Love the explosion of colour!!! Wow! How fun! it's going to be beautiful! How fun! I can't wait to see what you will make with all those colorful hexies! Your hexies are all wonderful! Love the fabrics your chose and the paper ones too. AWWW a hexie sewer after my own heart ! You did way more than me ! And yours is gorgeous ! BIG, Paper hexies....hmmmmm I like that idea ! Excellent idea to use monofilament! So clever! do enjoy the paper ones as well. Such great ideas! Thanks for sharing your tips! 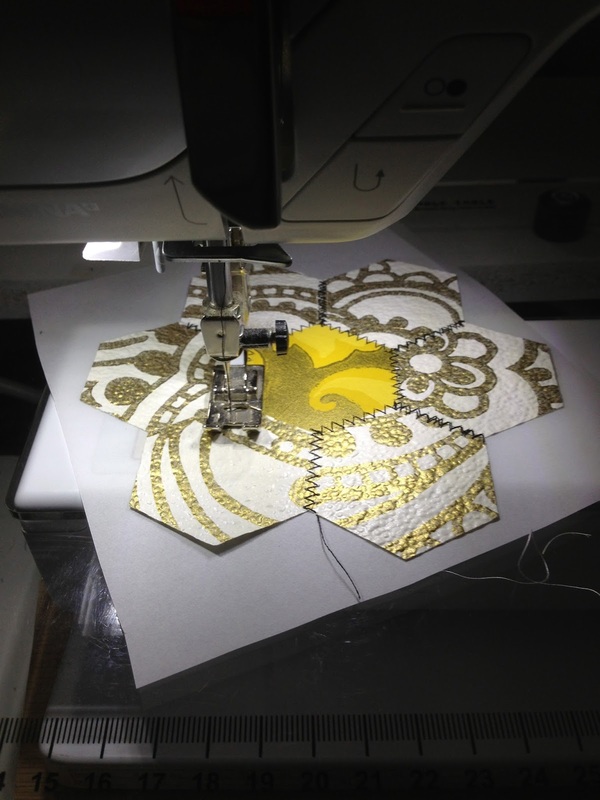 Beautiful work and that would be my way of making hexies.....on the sewing machine! Love all of your idea. Sounds like you found the best way to play with them. Thank you for sharing. I love the paper idea!!! I might even be able to do those machine ones...great idea. A great start on your hexies....and who knew they could be joined by machine! Thanks for sharing. Sew glad you found a way to enjoy hexies and do it "your way"!!! You are a genius machine sewing hexies together. Pretty sweet hexies. Thank you Sandra Kaye! I have never seen any hexies sewn together that way. It's really looking amazing. I really like your 1/4 inch hexies. I could never do those! Your paper hexies are really cute as well. Great idea for cards. Thanks for sharing. That is sew cute and colorful! I would like to try your technique of sewing them together. Thanks for sharing! Glad to see someone else combines the hand stitching with the monofilament thread by machine. That's the way to go! And I really am inspired by that hexie paper punch. It's now on my list for the next trip to the craft store. What fun to play with paper hexies. I love what you did! Wonderful hexies! I love the cheerful colors. Nice job. Genius move with the mono & zigzag. Might give it a try. What a great way to machine sew them together - very clever. And so it grows and grows! Easy Peasy, I like that! Sewing them together by machine? Genius idea. It's going to look awesome when finished. What a great idea to sew the hexies together with mono filament. That's much easier than hand sewing those suckers together. I haven't tried hand sewing them yet. I hand piece my traditionally - they finish 1". That's the way my mom did them, so I guess that's kind of the way I thought you did them. Thanks for participating and sharing your great projects. I hope to see you in more hops very soon. I learned 2 new things today. You can make things from paper hexies, and you can sew them on the machine. Wow, that quilt sure is going fast. 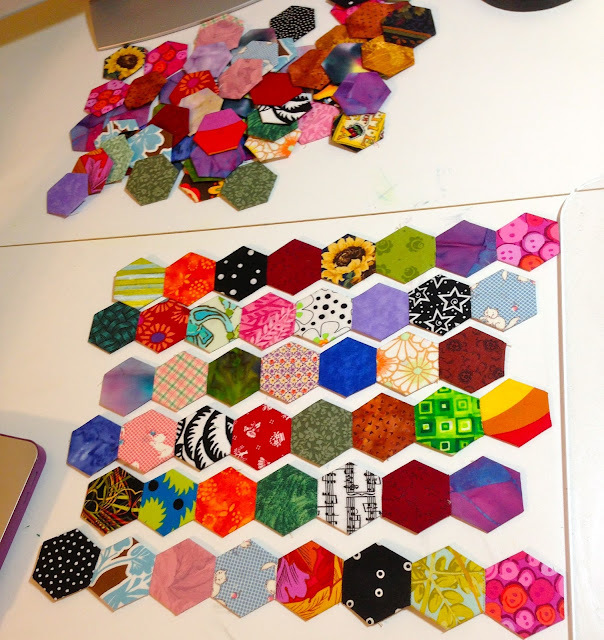 Your 1'4 inch hexies would make a great mini quilt to hang on the wall. Beautiful hexies what a gorgeous quilt they will make. Thanks for sharing all of your hexies with us. That will be sew pretty when finished. Love your ideas and what a wonderful treasure quilt your friend found. Lucky yoou. You are definitely a Queen of the Hexie. I want to try that now. Thank you for the inspiration and for sharing your hexies. I only made quarter-inch hexagons once to use as cornerstones in a machine-pieced hexagon baby quilt. Never again. I have to try machine-piecing hexagons with paper in it. 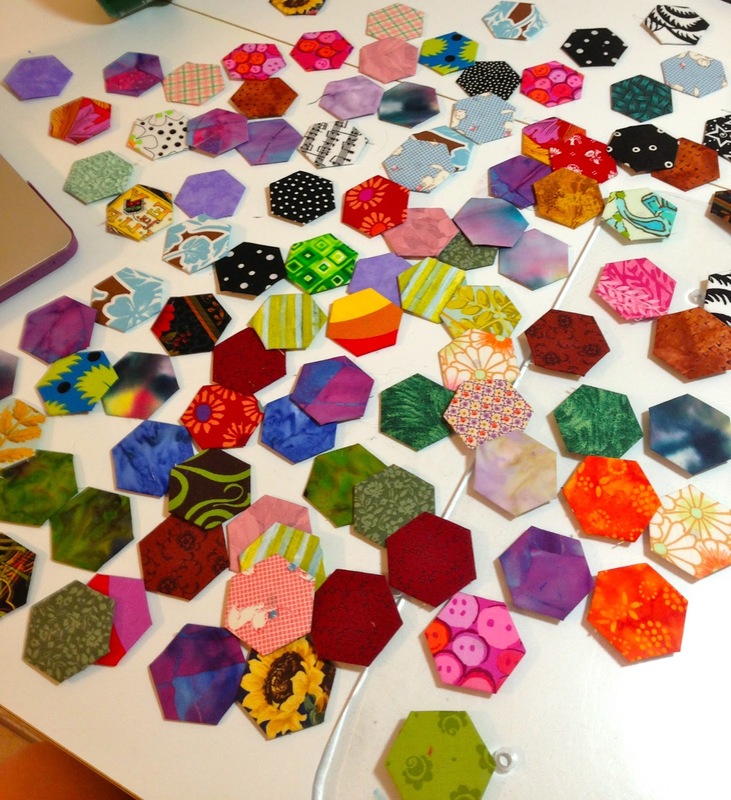 I have made quite a few one-inch hexagons already and I plan to set them in blocks. I can't see myself sewing my flowers together into an unmanageable size quilt. I would give up, I think, if I did that. Thank you for sharing. Oh and did your friend really get the king hexagon quilt at a garage sale? That is a great find! Looking good, Sandie! That might just work on something I have from umpteen years ago. You have my admiration for even trying in your early starts! Let's of inspiration here! I'm impressed with your paper hexies! Thanks for sharing your creations! Hmm.. machine quilting. I have not seen that version much. Most do hand quilting because of the portability. 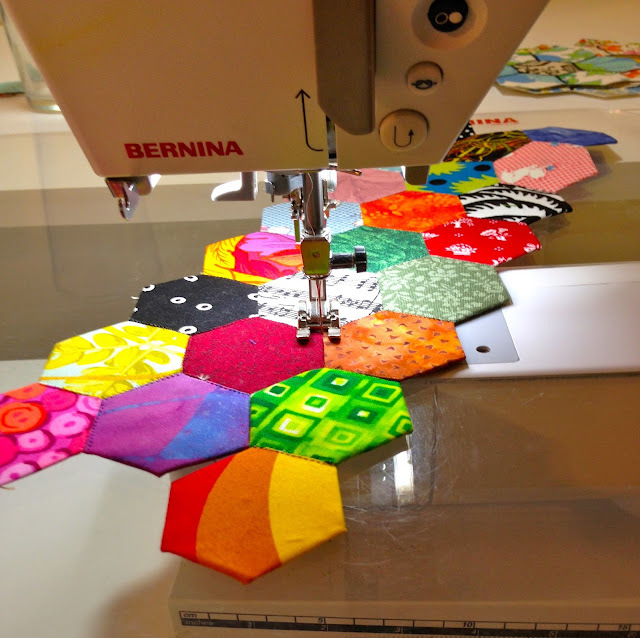 After sewing over 300 hexies together by hand, I love the idea of sewing them by machine. Thanks for the inspiration. Great ideas. Yay! I love that you sewed them on your machine - there is hope for me yet! Thanks for sharing, I can't wait to see the finished project. Its looking good! thanks for sharing. Pretty fun and colorful. Thanks for sharing. I am beyond impressed! This post is chock full of good stuff, starting with the lovely traditional GFG quilt. And paper ones!! I love paper. Must find the punch. I can see why the tiny ones did not grow, and using the clear thread to join the pieces will really help the project move along. Nice! WOW! After seeing this, I may just make something with hexies!! Wonderful job! What a lucky garage sale find! Love the hexies for greeting cards - hadn't thought of that and I have lots of paper left from my card making days. They would make fun gift tags too! You have done an amazing job on all the different sizes. It was interesting to read and see. Thanks. Thanks for sharing all your hexies. You're one up on me since I haven't even started to make a hexie. The paper hexies are a great idea but the hexies by machine spectacular!! I will have to give sewing them by machine a go. It takes so much less time. Your beginning quilt is beautiful!!! So clever to sew the hexagons together like this, and it looks so great!